Horrific picture alert. The settings are wonky on my camera right now but it's good, I swear. I just need to take a moment to give a big shout out to the Allrecipes.com ingredients function. Please tell me you use AllRecipes.com. Because if you don't then I have to spend a lot of time mourning for you and I have other things I need to get done today. It is a huge repository of wonderful recipes and the commenters always have super helpful tips and tricks and probably 90% of my very best recipes come from there. Then you can enter ingredients you want/have on hand and ingredients you don't want. For example, the other night I had a butternut squash that needed to get used and we'd only recently had butternut squash mac and cheese so I just put "butternut squash" in the Ingredients I Want list. And so it came to pass that we had some surprisingly delicious butternut squash pizza the next night (we put fresh mozzarella on ours. Because I couldn't not). On Monday night I found myself without a dinner plan. I had a zucchini that was getting to be borderline, a red bell pepper that needed to get used, and a bag of barley my grandma randomly gave me on Sunday. Ingredient search to the rescue! The one recipe that came up with those three ingredients was this cheddar topped veggie beef skillet. Bingo. The funny thing here is that 3 months ago I would have taken one look at this recipe and said, "PASS." Because the only things I would have considered eating in there were the beef and the cheese. It's amazing how much my tastes have changed since we started eating this way! 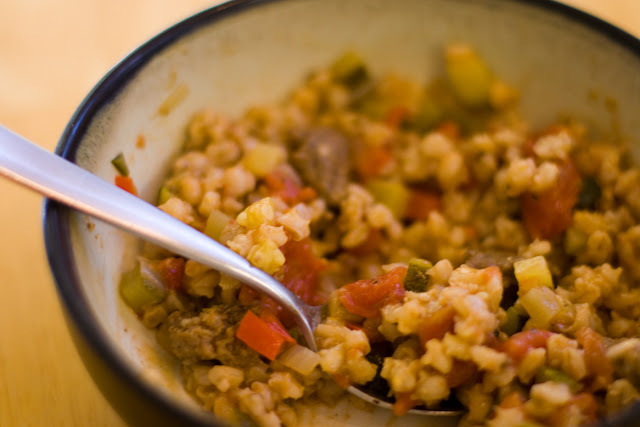 This recipe was warm and hearty and perfect for a chilly evening. I had everything on hand (even managed to find some ground beef in the freezer, otherwise ours would have been vegetarian) and it took about 45 minutes from first chop to putting everything on the table (and a lot of that was just leaving things alone to simmer). My kids loved it and the leftovers made for a quick and easy lunch the next day, which was nice after a very full morning of night-light shopping (try not to envy the excitement of my life). Originally from here . My notes are in italics. Bring the barley and water to a boil in a saucepan over high heat. Cover, reduce heat to low, and simmer until the barley is tender and the liquid is absorbed, about 30 minutes. Heat the oil in a large skillet over medium-high heat; stir in the ground beef. Cook and stir until the beef is crumbly, evenly browned, and no longer pink. Drain and discard any excess grease. Stir in the onion and garlic; cook until tender, about 5 minutes. Add the bell pepper, oregano, basil, salt, and pepper. Cook and stir until the bell pepper is crisp-tender, about 5 minutes. Stir in the cooked barley, tomatoes, zucchini, and kidney beans. Bring the mixture to a boil, reduce heat, cover, and simmer until the vegetables are tender, about 5 to 10 minutes. Remove the pan from the stove, sprinkle the cheese over the top, replace the cover, and let stand until the cheese melts, about 1 to 2 minutes. Oh my. Im excited, I normally just type what I want to make (mostly deserts) into google and just hope for the best. That ingredient thing is awesome, and I will definately be making dinner tomorrow night! Woot!